Margaret K. McElderry Books, 9781416963806, 352pp. Nick’s family has been on the run from magicians his whole life. His father is dead, and his insane mother hates him—she starts screaming if he touches her. After Nick’s protective older brother is marked with a demon sign that means death, danger is unavoidable. The only way to erase the sign is to kill a magician. As Nick and his brother play a deadly cat and mouse game with the magicians, Nick begins to suspect that everything his brother has told him about their past is a pack of lies. Not knowing whom to trust or where to turn, he walks into a trap—and a startling revelation that changes everything he’s ever believed. This debut urban fantasy, set in an England where magic is real, the first entry in The Demon's Lexicon Trilogy, starts with a bang. One minute Nick is fixing the sink in the kitchen while his older brother cooks. The next mintues the two are fighting for their lives, Nick with a sword and Alan with a gun, against an unkindness of ravens and a powerful magician. Killing the magician stops the attack, but it is a temporary respite. The two teens are demon slayers, in hiding to protect their ailing mother, an escaped magician. Now that Black Arthur has found them, flight is their only hope; however, before they can flee, a teenage girl asks for their help. Her younger brother has a three-tiered demon mark, a sentence of death, unless it can be removed. Nick's priority is to protect his brother, who has looked after him since their father was killed by demons. But Alan decides to share the demon marks, leaving Nick no choice but to find the magicians responisble. Until then, Mae and Jamie will have to flee and fight beside them. Nonstop action, nail-biting supsense, clever rapartee, and a knockout secret involving the two brothers will keep readers on the edges of their seats. There is resolution at the end, but it is just the first stage of the battle. More dangerous challenges await these two intrepid fighters in The Demon's Covenant. 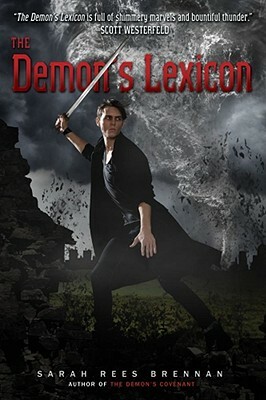 Fans of the paranormal and the Supernatural television series are going to enjoy the adventures of these demon-fighting brothers, but so will aficionados of sharp writing, complex characters, fast-paced plots, teen angst, and the struggle between good and evil.